In a McDonnell F-4C, Col. Robin Olds is about to roll opposite a North Vietnamese MiG-21's turn and split S into a missile-firing position for the first of his four MiG kills. On 2 January 1967, Operation Bolo specifically targeted the 15 MiG-21s then serving the North Vietnamese. 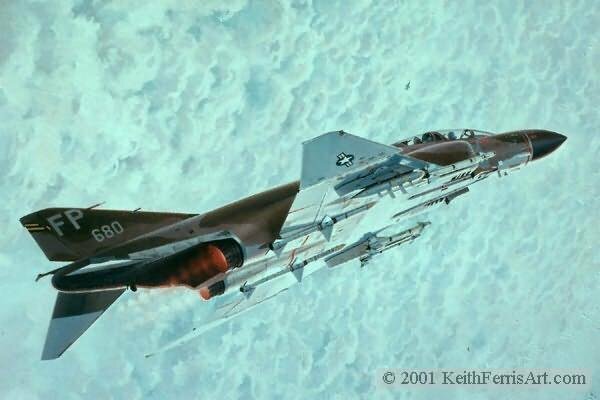 A force of F-4 Phantoms masquerading as F-105 Thunderchiefs, normally used in the bombing roll, successfully drew the MiGs up to intercept. The 8th Tactical Fighter Wing F-4s shot down seven. The painting documents the destruction of a MiG-21 by then 8th TFW Commander, Colonel Robin Olds. The viewer can clearly see pilot and back-seater, both wing tips, nose and tail, all control inputs, the empty missile stations from a previous unsuccessful engagement, and the important detail of the F-105 electronic jamming pod carried for this mission.